I am very excited to say that another one of those near and dear to me is going to have a baby and I couldn't help but get way too excited for what's socially acceptable. It's a problem I have (enthusiasm) and so many of my friends are starting families. 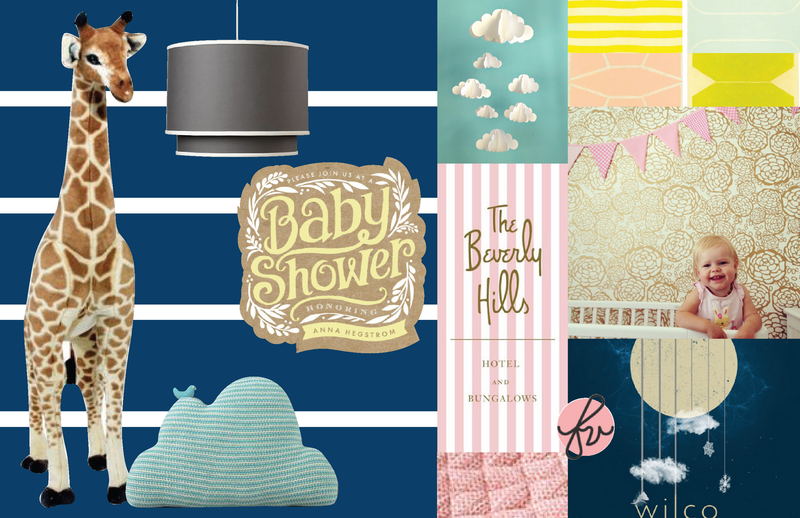 This is a mood board for the little lady's room. It has yet to be transformed (and I wasn't asked to do this...), but I see something crisp and modern with coral pink and butter yellow splashes to soften things up. I'm imagining the room so I can get started on some illustrations for the baby, but I'll admit that I wouldn't be disappointed if I went over to babysit and saw that this board had inspired them too. All images were sources from Pinterest. Obviously, I've picked a theme: sunshine safari (note the giraffe). Navy is a favorite color of the parents, and the navy-gray-yellow base is very easy to spruce up if a boy happens to be next in line. I always try to keep things practical and pretty. And clouds are my new favorite for babies. Sunshine safari! I love it! So sweet. That is definitely reversible if the next one happened to be a boy. What baby doesnt like clouds? Answer me that. I've never met one. I meet a lot of babies, so there must not be any that exist that don't like clouds.